I recently had the pleasure in taking part in a Pecha kucha evening as part of Edinburgh Science Festival, hosted by InSpace at the University of Edinburgh. If you haven’t heard of Pecha kucha before (and I hadn’t before the invitation arrived in my inbox), it’s a format for quick and informal presentations, derived from the Japanese term for the sound of chit-chat. The prospect was a little nerve-wracking: speakers present using twenty slides that are automatically timed to be displayed for just twenty seconds each… you have no control and no room for waffling! But on the night it turned out to be easier than it sounds and all involved had a great evening. Speakers from across the museum gave snapshots of their research, from underwater animals, to airshows, to Iron Age archaeology. My Pecha kucha was about research on early medieval sculpture, undertaken as part of the Glenmorangie Project on Early Medieval Scotland. I’m particularly interested in trying to reconstruct how these archaeological stone treasures would have looked when newly made, around 1200 years ago. This worn and broken piece of sculpture was found built into a garden wall in Aberlady, East Lothian in 1863. Fragment of sculpture found in Aberlady, East Lothian. It certainly has suffered the ravages of time and Scottish weather. 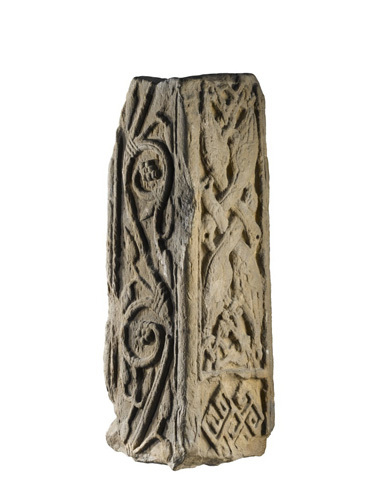 It is part of an Anglo-Saxon stone cross – originally it would have been a tall and very impressive monument. The first step in reconstructing what it would have originally looked like therefore means thinking about scale. This full-size reconstruction, now standing in the village of Aberlady, gives some idea of the impact such a monument would have had. 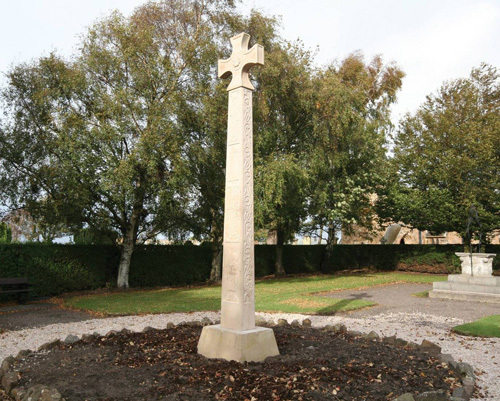 Full-size reproduction of the cross at Aberlady. 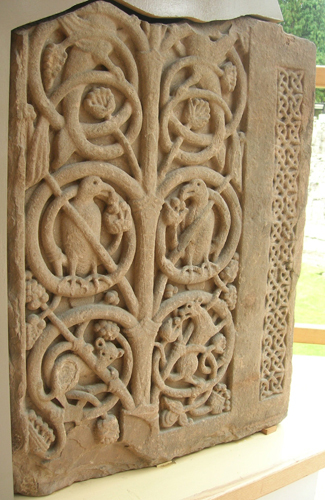 Like many pieces of Anglo-Saxon sculpture the decoration of the Aberlady cross features life-like birds, animals and people with small drill-holes for eyes. Scholars of Anglo-Saxon art have long suggested that these eye sockets would originally have looked very different: instead of being empty it has been assumed that they would have held small pieces of glass or semi-precious stones (such as amber). However, none survive – not a single piece of Anglo-Saxon sculpture from the whole of Britain has surviving eyes. So are these assumptions correct? Or were the creatures that decorate these important early medieval monuments intended to have (slightly unsettling) shadowy wells for eyes? The original fragment from Aberlady is on display in the National Museum of Scotland’s Early People gallery. When it was temporarily removed to allow new photographs to be taken, I took the opportunity to have a thorough look at it. I thought I could see something in some of the drill holes, but thought surely it must just be dirt? With the enthusiastic help of colleagues in our Analytical Research division, we took a closer look. Using a good microscope and a scientific technique called X-ray fluorescence (or XRF for short) we investigated some of the holes. 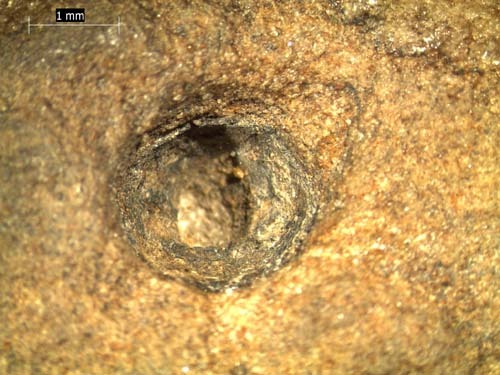 XRF can tell us what things are made from – and in this instance it demonstrated that there was tin inside the most well-preserved eye sockets. Under strong magnification it became clear that we weren’t dealing with mere traces of tin, but an intact sheet of tin, lining the bottom and sides of the socket. A close up look into one of the bird’s eye sockets. Soft metals were often used on early medieval objects to hold decorative stone or glass pieces in place, and it seems that they were using the same technique on stone. This provides the first such evidence from Britain and crucially it helps us get one step closer to how the sculpture would originally have looked. A little bit of experimenting gives us an idea of the effect that could have been achieved. An experiment to see how stone sculpture might have looked with glass eyes. Just imagine the rising and setting sun glinting off beady-eyed creatures, crawling up a towering stone cross toward the sky. 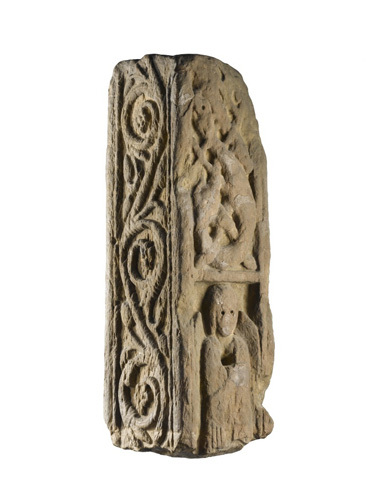 Anglo-Saxon sculpture, like this piece from Jedburgh in the Scottish Borders, features some of the most life-like carvings of animals I’ve ever seen. Carved slab found in Jedburgh, in the Scottish Borders. Because the Jedburgh slab is particularly well preserved, if you look closely it is still possible to see the fur on the back of this little mouse: just imagine him with bright, shiny eyes! Close up of the Jedburgh mouse – imagine him with bright eyes! You can find out more about the Glenmorangie Early History project here. Hank you Alice. Of course, the reconstructed Aberlady Cross does indeed incorporate specially manufactured glass within the drill holes of the eyes. Amber glass was selected for the various birds and beasts and blue for the angel and Jesus figures. And as you suggest they do indeed glint in the light, thus enhancing the lifelike qualities of the carvings. Youir advice on this was much appreciated. The glass eyes wouldn’t even have to be monochrome. Contemporary glass beads often were decorated with dots; making beads that had whites, iris and pupil would not have been hard considering some of the complex layering I’ve seen. Has there been any research into whether early medieval sculpture in Scotland might have been painted? I know there is speculation about it, and I know that there have been some new techniques for detecting traces of specific pigments in Greek statues. I wasn’t sure whether any these techniques had been applied to Scottish sculpture though. 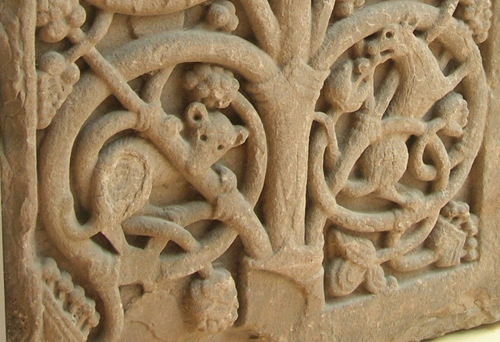 It is generally assumed that Early Medieval stone sculpture would have been painted, probably in garish colours. Many of the decorative motifs on stone sculpture are also found in illuminated manuscripts of the time which are richly coloured in reds, yellows, greens, blues and gold leaf. 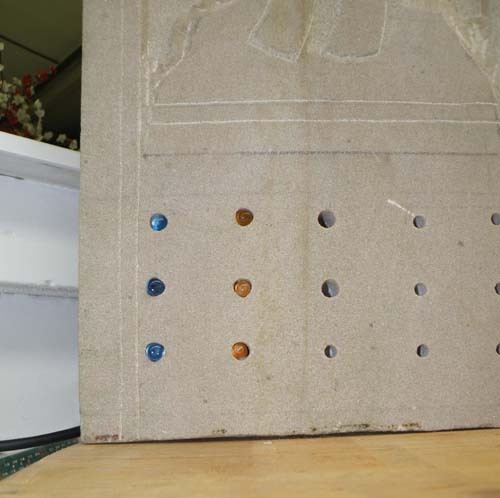 However, finding evidence for coloured pigments which were deliberately applied to stone sculpture is rare. The best evidence comes from an 8th Century Anglo-Saxon fragment of sculpture from Lichfield Cathedral. Known as the Lichfield Angel, this winged figure was painted in a palette of red, yellow, white and black pigments, while the halo was also likely covered in metal gilding. This is a highly unusual discovery, because pigments were usually made from naturally occurring iron oxides or vegetal products and so do not survive well if left open to the elements or buried in the ground. Additionally, the stones used for making sculpture can have naturally occurring iron minerals throughout them which can leach out from over 1,000 years of weathering, giving the impression (wrongly) that there is red or yellow pigment surviving. Micro-analytical methods (such as thin-section analysis of the stone, scanning electron microscopy and Raman analysis) can help us identify whether the iron particles were applied to the surface and if so what they would have been mixed with to act as a binder (e.g. egg, animal fat or beeswax) suggesting that it was indeed a deliberately applied pigment. The Hilton of Cadboll carved stone on display in the Early People gallery in the National Museum of Scotland has slight traces of reddish-brown colour on its original Pictish face. Thin section analysis of fragments recovered from recent excavations (summarised in James et al A Fragmented Masterpiece: recovering the biography of the Hilton of Cadboll Pictish cross-slab, Society of Antiquaries of Scotland, 2008) at the original site where this stone stood has told us that this could be a deliberately applied pigment. have you got any better pictures of the reproduction cross? The relief doesn’t look as high as the original in the picture here. This fragment very similar to an old anglo saxon cross base now in the church at Rothbury, Northumberland. Hiya, I’m afraid that’s the only picture I can find. That’s interesting about the cross at Rothbury – are there pictures of it online anywhere? Glenmorangie Research Project: when are glass beads from a Pictish site not Pictish?